Chelsea defeated West Ham United 2-1 to go ten points clear at the top of the Premier League. West Ham started well, but were stung on the breakaway by the Blues’ emphatic pace. N’Golo Kante won the ball high up the pitch and found Eden Hazard. The Belgian linked well with Pedro, with the Spaniard sliding the ball into his teammates path. Hazard kept his cool, rounded Darren Randolph and found the back of the empty net. Hazard has now scored 11 Premier League goals so far this term, and is well on his way to beating his best tally in England’s top tier of 14. He also has four assists to sweeten the deal – what a player. Merely five minutes into the second period, Diego Costa doubled his side’s advantage. Hazard’s corner was flicked on by Pedro Obiang and bounced off Costa’s knee into the net. 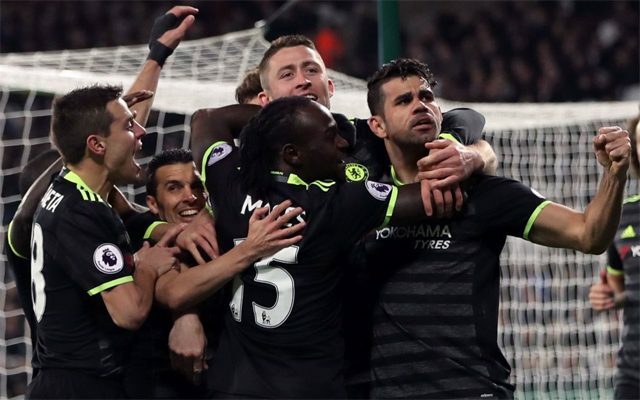 It wasn’t the prettiest goal the Chelsea talisman has ever scored, but it could prove pivotal in the title race. Seconds before the final whistle, Manuel Lanzini gave the home fans something to cheer about. Lanzini beat Thibaut Courtois with an emphatic finish to ensure the Golden Glove favourite wouldn’t keep his 14th clean sheet of the season. Courtois will undoubtedly be frustrated to have conceded.